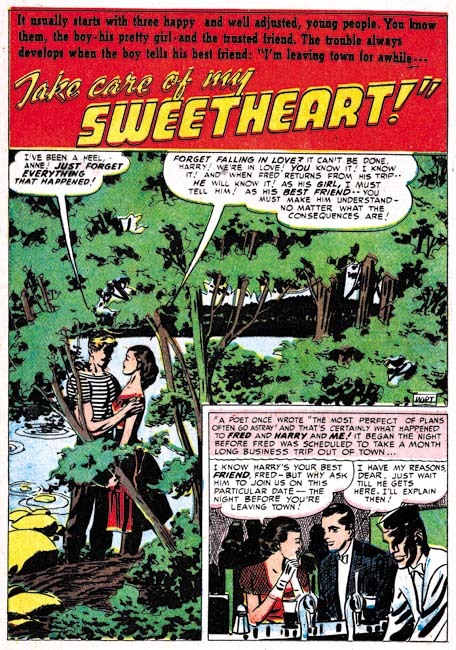 In the last chapter the most prolific romance artist was Bill Draut. This was somewhat of a fluke because Draut held that position only for a short time and Mort Meskin would once again regain the top position by producing 77 pages of art. However this time Mort would achieve such high page counts not by his efforts alone. 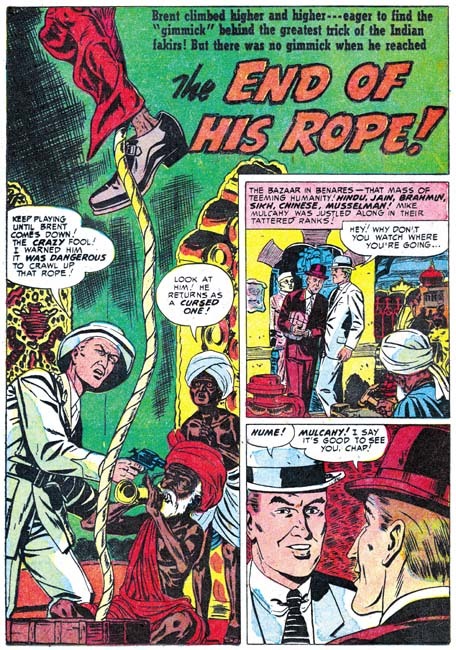 Some of Mort’s art covered here was inked by George Roussos. Exactly how much is not clear as there are some works I just have not been able to decide about the inker. Jack Kirby picks up second place with 42 pages but other artists are not far behind him. It has been some time since Jack was the dominant artist. The other two usual suspects take the next positions; Bill Draut (36 pages) and John Prentice (34 pages). Bill Walton does a surprising, for him that is, 22 pages. The other artist (George Roussos, Al Eadeh(?) and Bob McCarty(?)) provide only a small number of art pages. Jack Kirby may not have been as prominent a presence as he once was but he still did some incredible art. 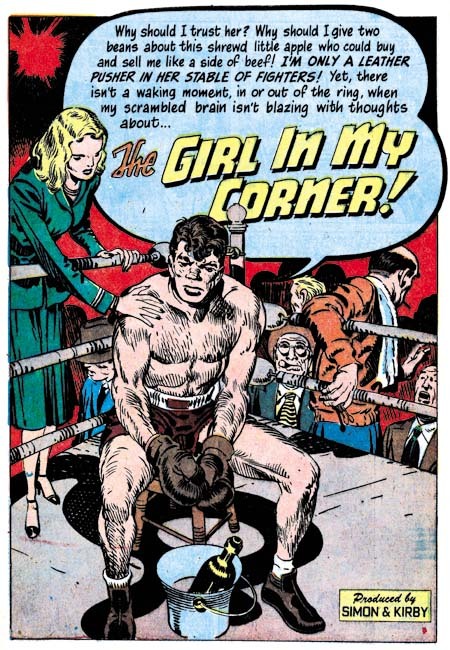 The confessional splash for “That Girl in My Corner” is a great example. What a moving figure the fighter presents; perhaps a little tired and haggard but by no means defeated. His girl presents the least interesting character of the splash but check out all the on-lookers. The background figures may not have played an important place in the splash but they are just the sort of added spice that provides the proper atmosphere. There was a time when the first, or featured, story almost always used a confessional splash. That has changed in recent months. 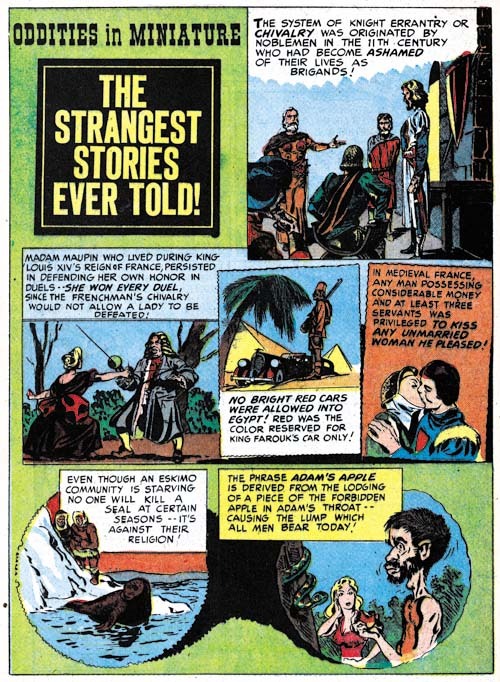 Of the eight comics reviewed here only one of the featured stories has a confessional splash. That is not to say that the first splash did not always get good treatment. In fact I had a hard time choosing between two of Kirby’s splashes to present here; they both were so good. 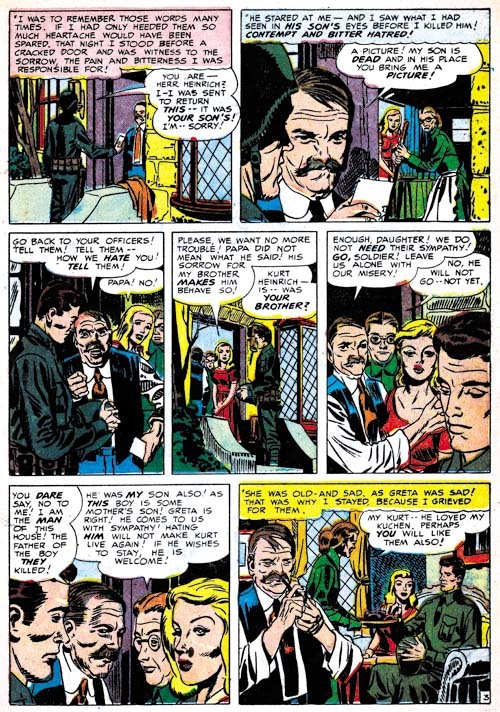 Another of the changes occurring to the Prize romance titles is that previously if Kirby appeared in an issue he would most likely do the feature story. This was no longer the case; Jack only did three of the eight featured stories. 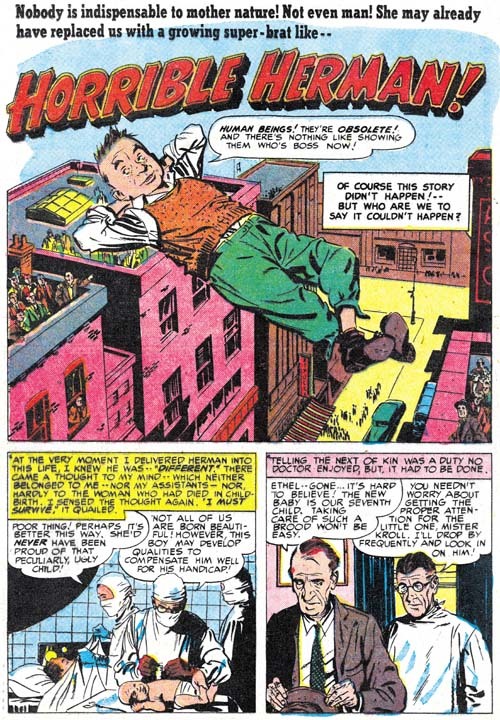 Three of the other featured stories were done by Bill Draut. Another change was the splash for the featured story did not always take up a full page. While in the earlier romance issues the featured story seemed chosen from the start, now more and more it seems like it was indistinguishable from any of the other stories. At a quick glance the cluttered desk top could belong to anyone. The story is about a newspaper artist but look what is on the drawing board cut off by the left edge. Looks like comic book art to me. One practice remained, the teaser. I wonder if the teenage girl readers understood the suggestion of prostitution that John Prentice’s splash provides, but I am sure any adult viewer would. Perhaps this was done on purpose to entice an adult to purchase the comic expected a lurid story. But any adult that did buy the comic was certainly doomed to disappointment. In this case the real crime that the girl did was theft. John Prentice would sometimes abandon a splash border. It is a technique that allows the story to stand out from the others. 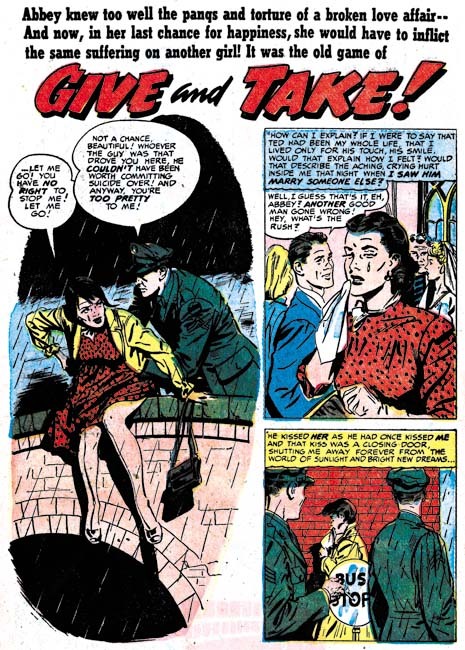 The theme of a man preventing a woman from suicide is one that he would draw again years later for Harvey Comics (“Paid in Full” was discussed in Kirby Imitating John Prentice). Interestingly Prentice left out the border for the splash for the Harvey story as well. The confessional splash is not always limited to the feature story. I believe the confessional splash for “Bring a Girl” is the only one that Bill Walton did. It is also Walton’s only full page splash for Simon and Kirby. 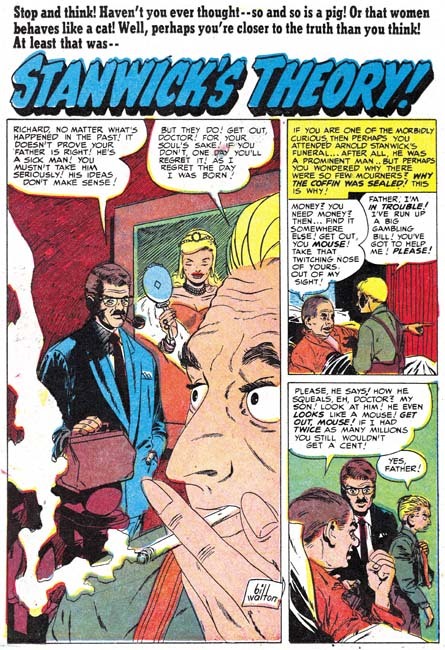 Its uniqueness suggests that this story may originally have been intended for the feature story but got replaced by Kirby’s “Girl in My Corner” which in my opinion was a good choice. Still it is the best splash that Walton would do for Simon and Kirby. So nice that I also suspect that Walton was provided a layout, most likely by Joe Simon. Some of the art by Mort Meskin for this period have been inked by a brush technique I do not remember seeing in his art before. The technique is call a split brush where by the brush is manipulated to form multiple tips. With this technique it is possible to ink parallel lines with one stroke. In the inking of “Marriage on the Rocks” this can best be seen as short strokes on the man’s shoulder. Meskin has a preference for spotting with parallel lines but in the past did them with separate brush strokes. I cannot make up my mind if this is Mort just experimenting with the split brush technique or if it indicates that another artist did the inking. 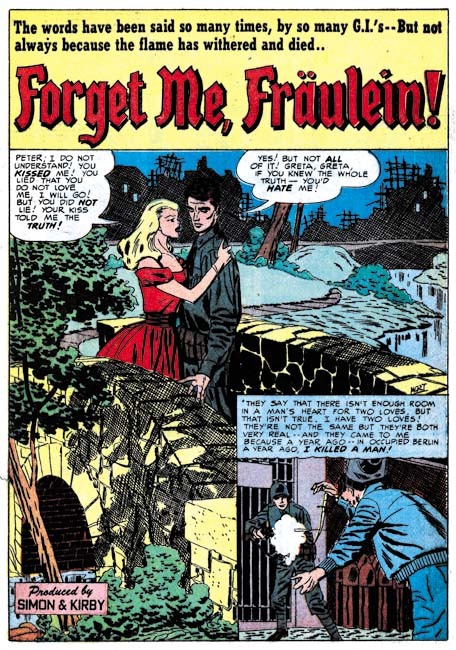 According to the Jack Kirby Checklist, “forget Me, Fraulein” was penciled by Jack Kirby and inked by Mort Meskin. The biggest problem with that is there on the right edge just above the story panel is Meskin’s signature. 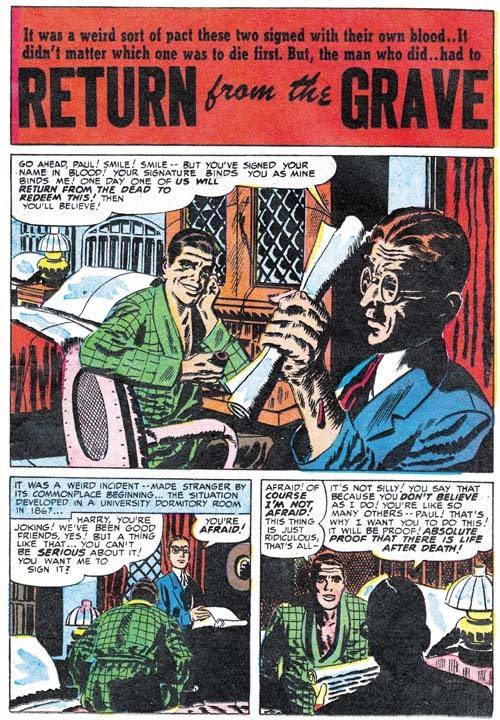 I am sure that some will still say that Kirby did the layouts, but it is clear to me that Mort was not working from layouts supplied by Jack. That is not to say Kirby did not influence Meskin, Mort had been working along side of Jack for three years and had picked up some things. The easiest clue that these are not Kirby layouts, now that it has been pointed out in a previous comment by Steven Brower (Little Shop of Horrors, Chapter 5), is the narrow depth of field. 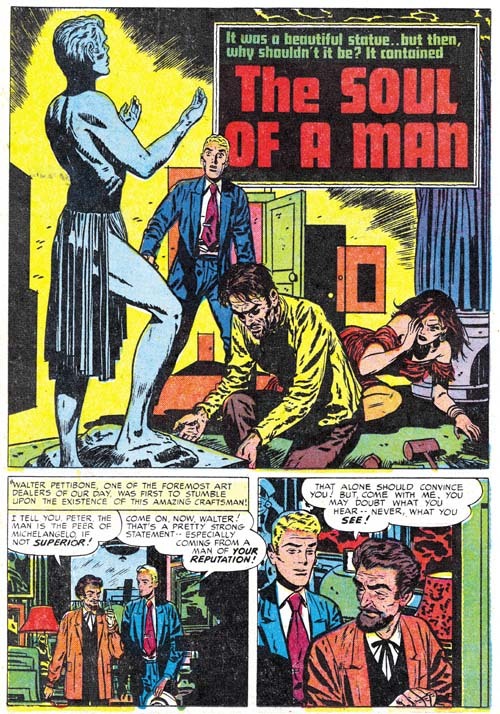 Most of the men look much more like Meskin’s than those drawn by Kirby. However there is something to the men that is a little off from typical Meskin and the Fraulein looks nothing like Mort’s. A clue as to why this story seems so odd is found in the picket fence crosshatching (see Inking Glossary) found in panel 3. This Studio style inking technique is found nowhere else in this story. 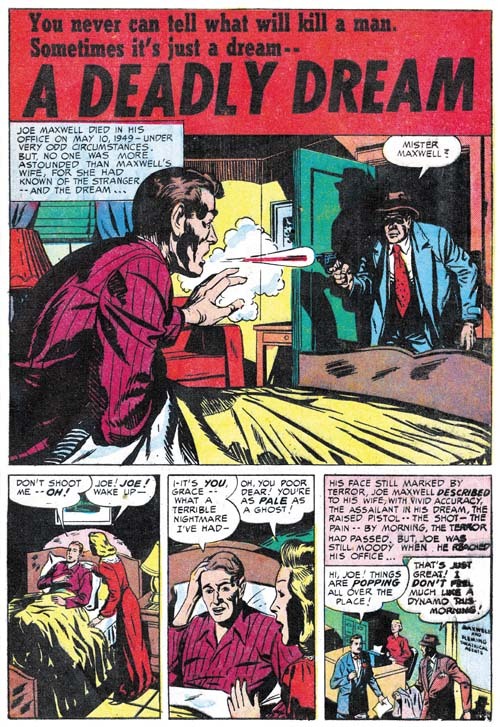 While the picket fence crosshatching does not recur elsewhere in two panels at the bottom of page 6 there can be found Kirby’s blunt inking brush. One of these panels has a man obviously drawn by Kirby. Apparently Kirby has taken on his roll as art editor and provided numerous touchups to the art. 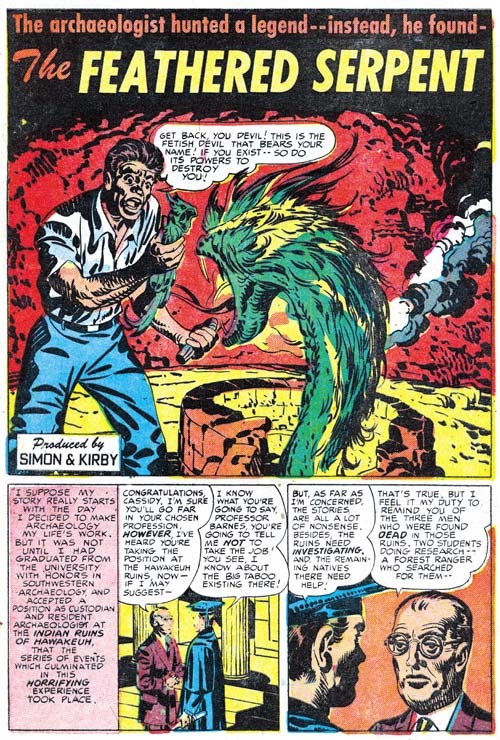 It is unusual to find Kirby doing any corrections on Meskin’s art and never before have the corrections been so extensive. The reason becomes clear when the inking is examined more closely. Particularly revealing are the manner the cloth folds are spotted. They are not inking with the sweeping parallel brush strokes that Meskin typically uses but rather by the somewhat splotchy method employed by George Roussos. So what has happened was that Roussos inked Meskin’s pencils in a manner very typically for George, that is to say rather poorly. Since this was going to be used for the all important feature story, Kirby had to do a surprisingly large number of touchups. In the end the story is a mixture of a majority of pieces that look like they were penciled by Meskin, a surprisingly number of parts that look like Kirby’s work and in even a few places part that look like they were drawn by Roussos. 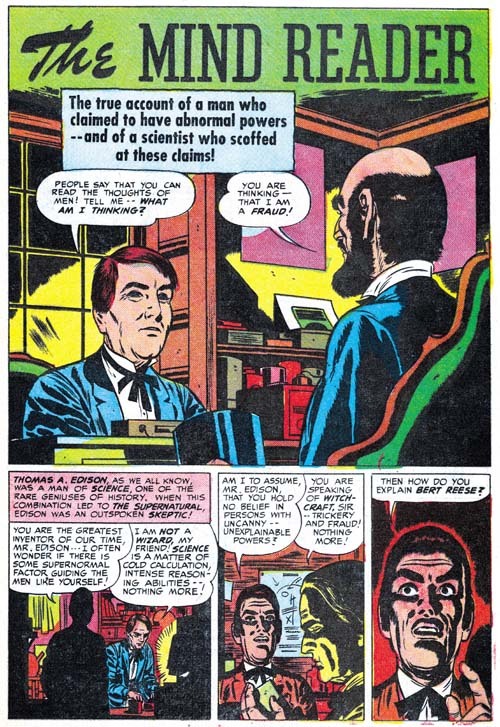 George did a great job of inking Mort’s art when both were working for DC but here in the Simon and Kirby studio Roussos just seems to do little more than mess up Meskin’s pencils. When writing about the differences between Mort Meskin’s inking and that of George Roussos I have been pointing out their different manner of spotting the cloth folds. While that is usually the easiest means that can be used to determine the correct inking credits, it is not the only why the two inkers are distinct. 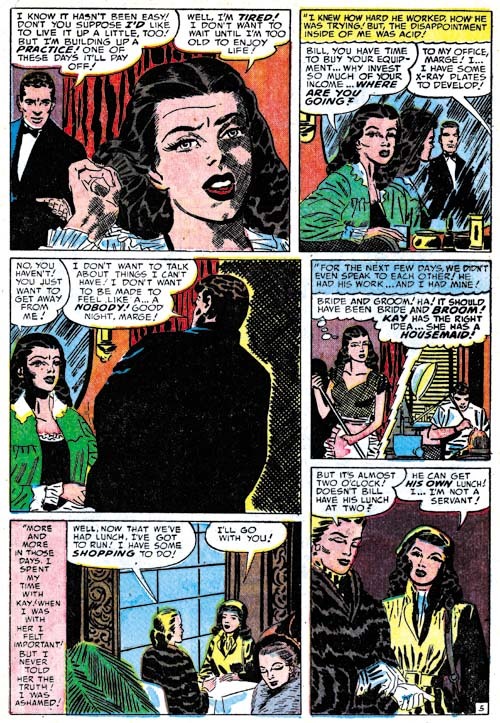 Both inkers have a fondness for crosshatching but Mort generally only uses it if fill up blank backgrounds while George will sometimes use it on such things as figures as shown by the woman in the first panel from the page shown above. Note how the crosshatching is fine and done at approximately right angles. That is not the manner that Meskin uses for the rare occasions that he does crosshatch a figure as for example in story he later did for Harvey (see Horrible Meskin). There the crosshatching is not so fine and the angle between the lines is much more oblique. I have previously remarked about the large eyes drawn by the artist that I am questionably calling Bob McCarty. Unfortunately the images that I provided were not the best ones to show that feature so I am glad to finally be able to provide a good example, “Loving is Believing”. Also not how the splash panel is actually the first panel of the story as well. This is not a technique that I have had occasion to comment on before. While this may be the first use of the way of presenting a story, now that it has been introduced we will be seeing it again. I will close with another specimen of work by Al Eadeh(?). I have not discussed this artist work in detail because I really feel his style, particularly the way he does eyes, is so distinctive that he can easily be recognized. Now all I have to do is find something with this style that he signed. I normally like to start the chapters of my recent serial posts with a discussion about the amount that of the various artists contributed to the issues. Usually just a few artists, sometimes even just one, predominate. But in the Black Magic issues covered in this chapter a much more evenly distributed situation occurred. 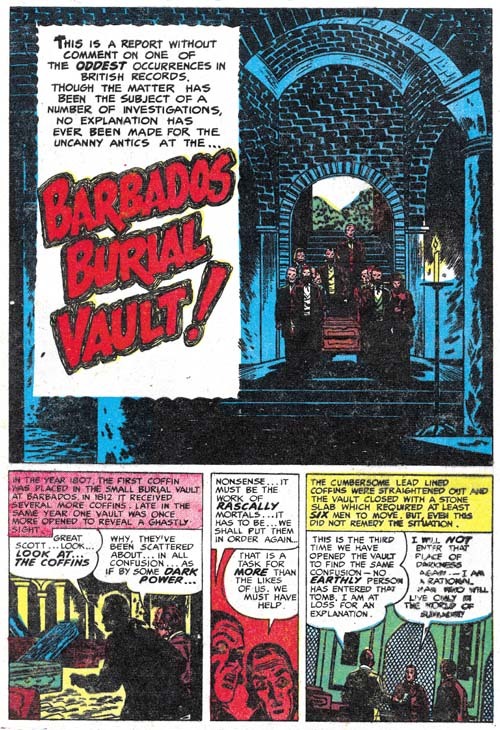 The ranking is George Roussos (19 pages), Jack Kirby (18 pages), Bob McCarty(?) (15 pages), Bill Draut (14 pages), Mort Meskin (13 pages), Bill Walton (7 pages) and Al Eadeh(?) (7 pages). 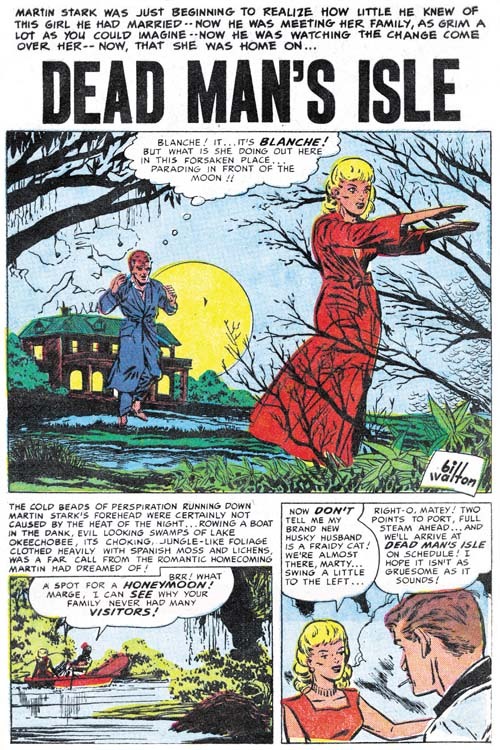 While during the same period in the romance titles, Jack Kirby provided very little art, in the horror genre he takes second place. Kirby has not held that position for in any genre for some time. Jack Kirby’s human anatomy really was not very accurate, but his animal anatomy bordered on the fantastic. 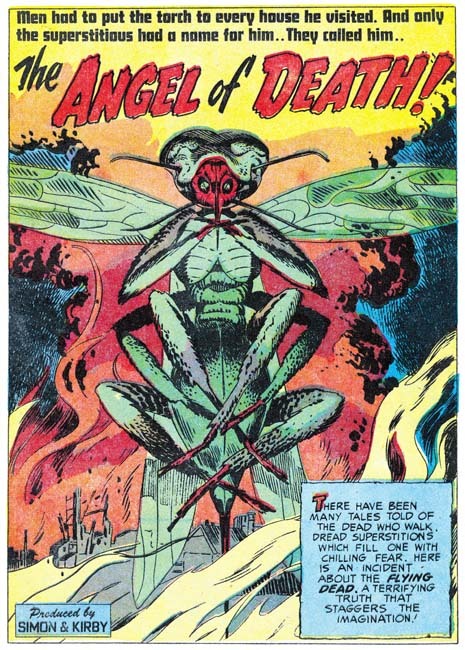 In the splash for “The Angel of Death” there appears to be a gigantic insect, but insects have six legs, not eight. Nor do any of an insect’s legs emerge from the final body segment as Kirby depicts. Despite these sorts of inaccuracies that would have caused Kirby to fail any biology class his animal creations have a special life. Even before reading the story it is certain that we would not want to meet this particular angel. One story in the issues covered in this chapter stands out from all the rests, but not the bests of reasons. Even though “Freak” is the featured story it frankly is a mess. The art is clearly the worse of any in these issues. Why than would it be listed in the Jack Kirby Checklist? Well actually for good reasons. Note the panel shown above. While it seems very poorly inked it clearly looks like Jack’s work. This panel, from the start of the story, is probably the most obviously one showing Kirby’s hand . However even on pages not so easily attributed to Jack the graphical story telling, the particular cinematic approach used, are his alone. 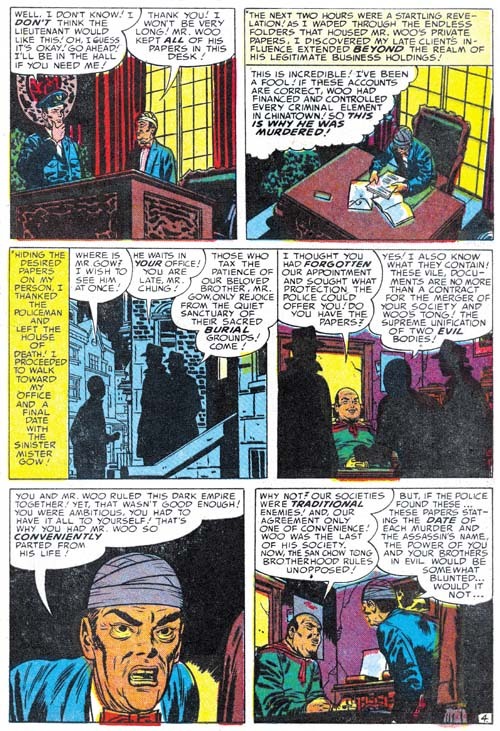 The Jack Kirby Checklist attributes the inking of this story to Mort Meskin; however the spotting is nothing like his. This can most easily be seen by the way the cloth folds are inked. Mort typically builds them up with a number of close parallel brush strokes that may overlap but usually can be detected at the ends. The cloth folds in “Freak” are nothing like that. 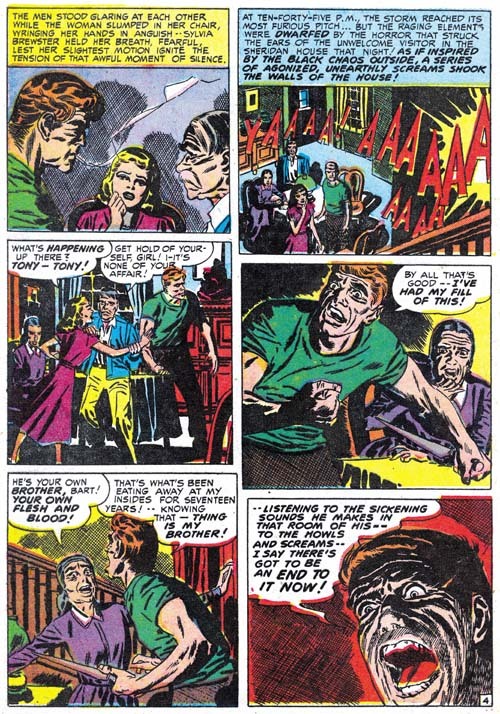 When Mort inks Kirby pencils he usually adopts the Studio style inking. 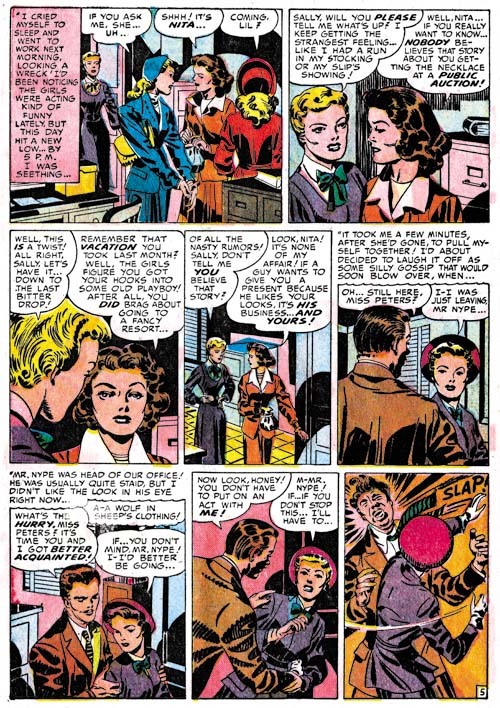 However picket fence crosshatching, drop strings or any of the other Studio style spotting techniques (see Inking Glossary) are completely absent in this story. The only reason that I can see to credit Meskin with the inking is that some of the faces have a Meskin look to them. While Meskin is a poor match for the spotting found in “Freak” there is another artist whose inking is an exact match, George Roussos. George does cloth folds in exactly the same manner when inking his own stories. Many of the faces have a light source coming up from below. While that technique was occasionally used by other inkers, it is a common technique of Roussos. George Roussos had a long history of inking Meskin and Meskin-like faces appear in his work from time to time. This may mean nothing more then the large influence Mort had on George’s art. On the other hand it may mean that Mort touched up parts of the story. In any case Roussos clearly did almost all the spotting for “Freaks”. While I have attributed the pencils to Kirby this maybe another of those occasions where Jack provided nothing more than just layouts. 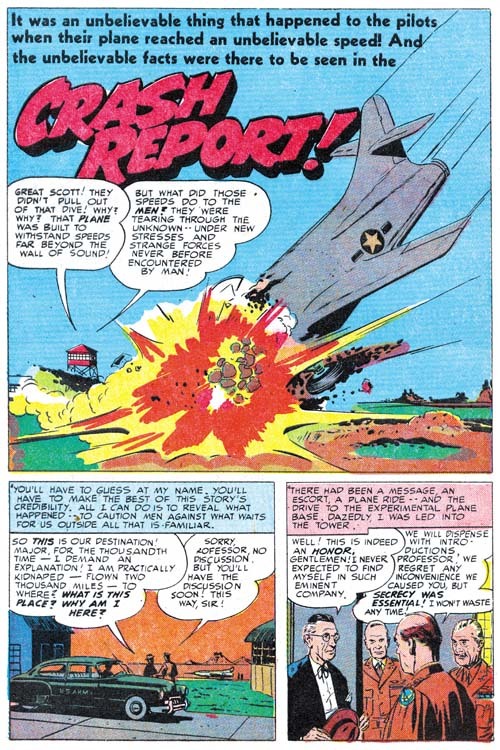 The fact that the most Kirby-like portions are at the beginning of the story suggests that might be true. Whatever the type of pencils provided Roussos has clearly botched the job. Not only does the final result really do not do justice to Kirby, the art is actually much inferior to Roussos own work. So much for the theory that Kirby’s pencils were so good that they made a poor inker look good. 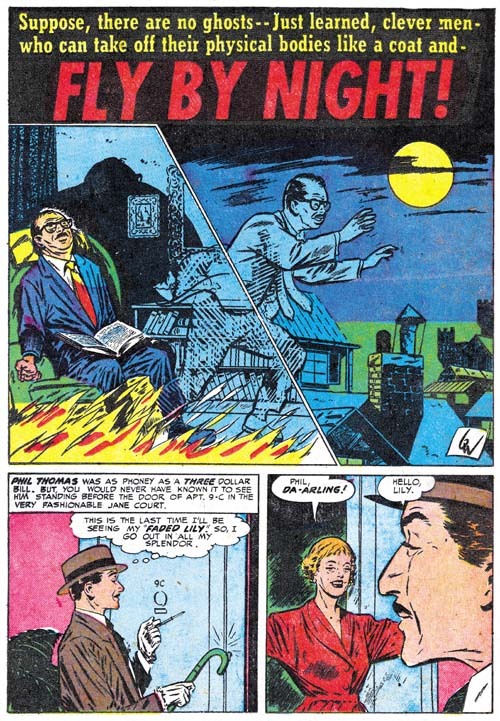 Mort Meskin penciled two Black magic stories during this period. 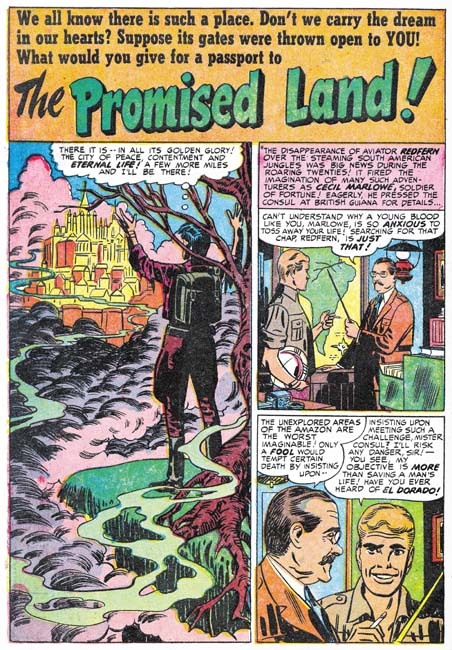 One, “The Promised Land”, is a nicely drawn and inked work very much up to Meskin’s high standards. There is no reason to go into detail about this work, it very much matches most of Mort’s other Black Magic efforts. While Meskin did good romance art he does seem to particularly shine in the horror genre. I wish I could be as complementary about Meskin’s other contribution, “Guardian Angel”. There is a simple explanation for the disparity between the two Meskin stories from this period, “Guardian Angel” was not inked my Mort. 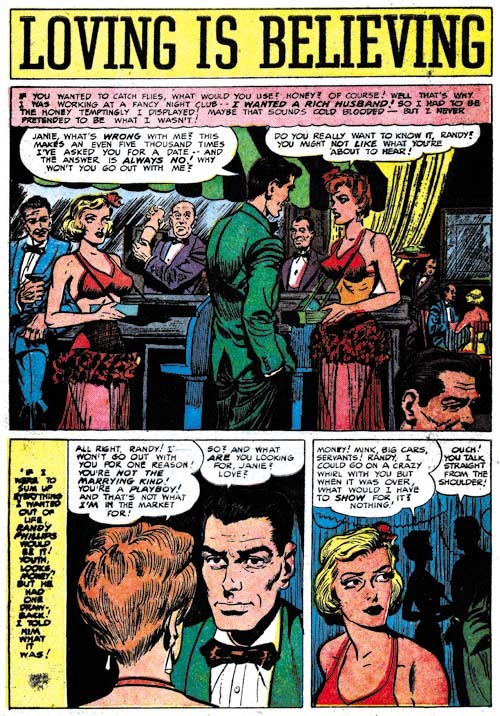 In the chapter from The Art of Romance that covers this same period (Chapter 20) I remarked that there were some Meskin pieces that I felt were inked by George Roussos. Well Roussos’s hand is even clearer in “Guardian Angel”. This is again easiest detected by an examination of the cloth folds. They are not constructed by parallel lines as Meskin would have done but done in the same splotchy manner typical of Roussos. 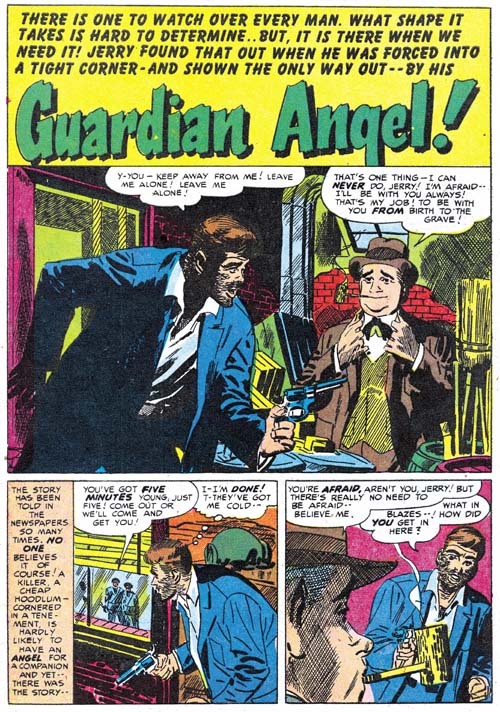 It would seem that having a piece inked by Roussos had unfortunate consequences at this point in time although “Guardian Angel” came off much better than “Freak”. I never want to make it seem like Bill Draut was not doing anything worth while. His “The Soul of a Man” is particularly memorable because it includes a man physically abusing and then savagely killing a woman. Simon and Kirby were still willing to include such strong material but in a few years the Comic Code would completely eliminate such stories. Bob McCarty(?) has some nice work as well. 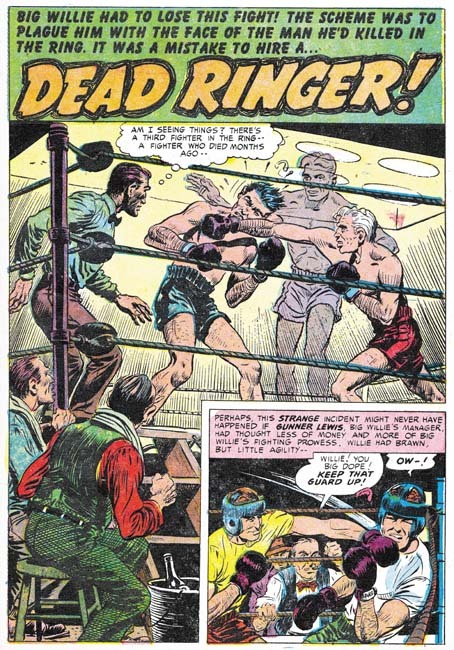 No chance that Kirby provided any layouts for “Dead Ringer” because Jack certainly would not have depicted a punch like this one. Bill Walton is not among my favorite Simon and Kirby artists but he does a nice job on the splash for “Fly by Night”. The unusual inking works quite well with the image of astral projection. Like Walton, Al Eadeh(?) only provides a single story. He is another artist that I am not overly fond of although he certainly competent enough. 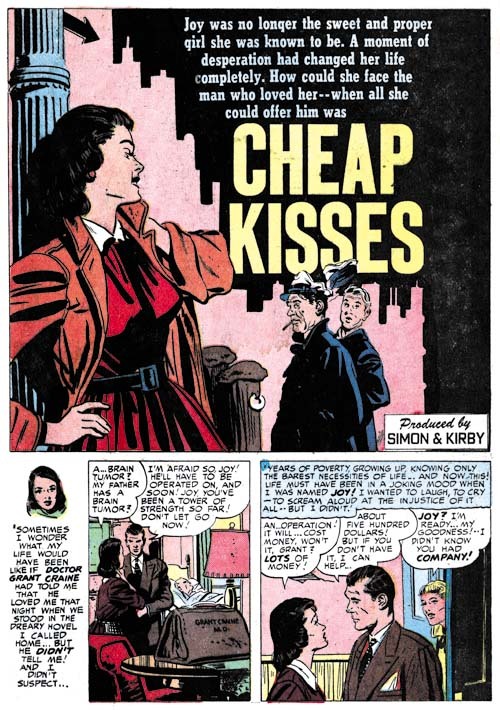 Simon and Kirby not only created the romance genre of comics, they also made quite a bit of money from it quite well. 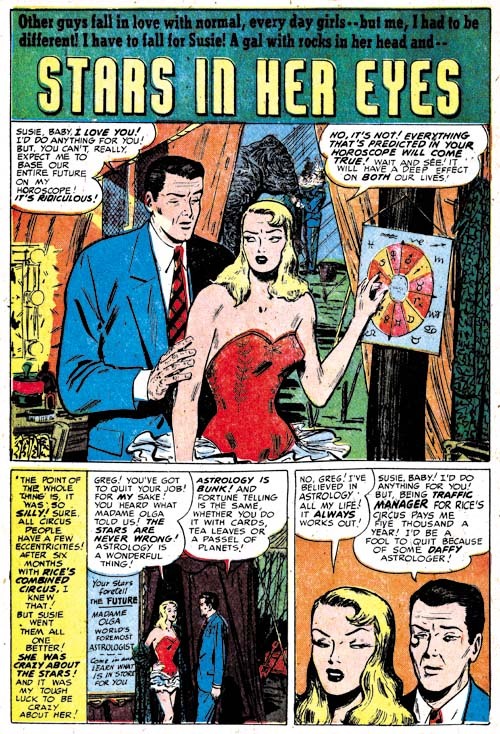 Their agreement with Prize Comics gave Joe and Jack a share in profits but it also required them to cover all the costs of producing the art. 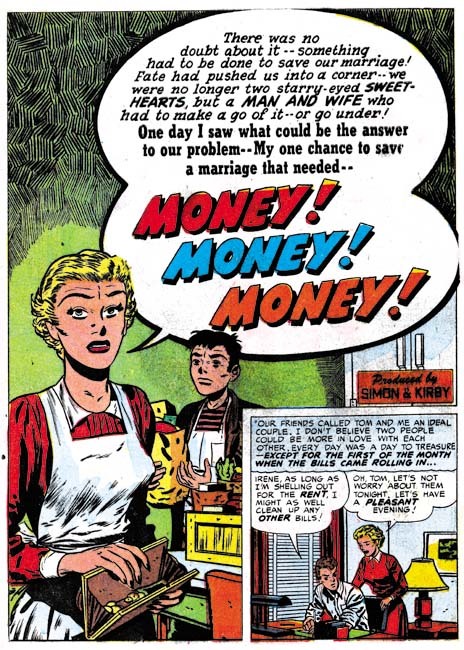 If sales for the love comics were not sufficient, Simon and Kirby could actually loose money. However there are two indications from the period covered in this chapter that indicate that the Prize romance titles were doing quite well. One is that Young Romance reached its 50th issue. Of course there is nothing really special about the number 50 (as compared to 49 or 51) but it does make a convenient benchmark for how successful the title Young Romance was. Most of the titles created and produced by Simon and Kirby did not last past 7 issues. Young Romance, Young Love and Black Magic are among the exceptions. Justice Traps the Guilty was another title created by Joe and Jack but they did not actual produce it over most of the title’s run. 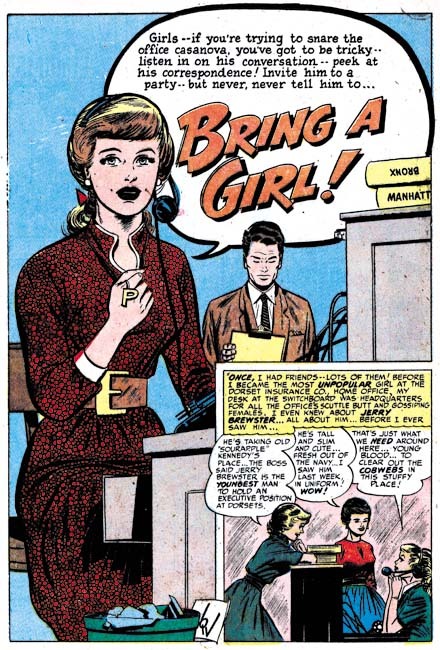 There is a second indication on how successful the Prize romance comics were. 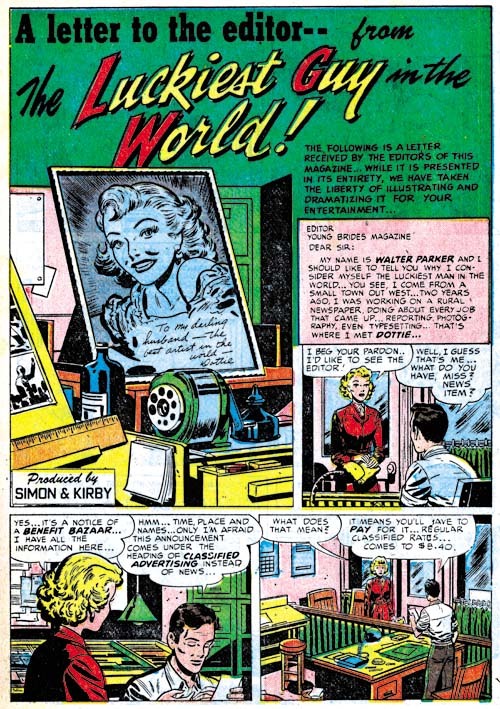 Simon and Kirby titles were typically started as bimonthlies. You can tell if a title was doing well because either it would become a monthly or a spin-off title would be made. Apparently the S&K love comics were doing well but Young Romance and Young Love were both monthly so the only option was to introduce another title, Young Brides. 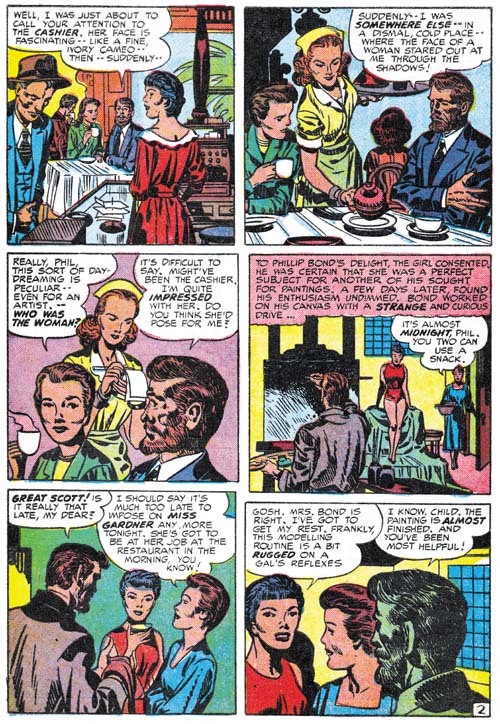 Young Brides would also follow Simon and Kirby’s modus operandi and begin as a bimonthly. 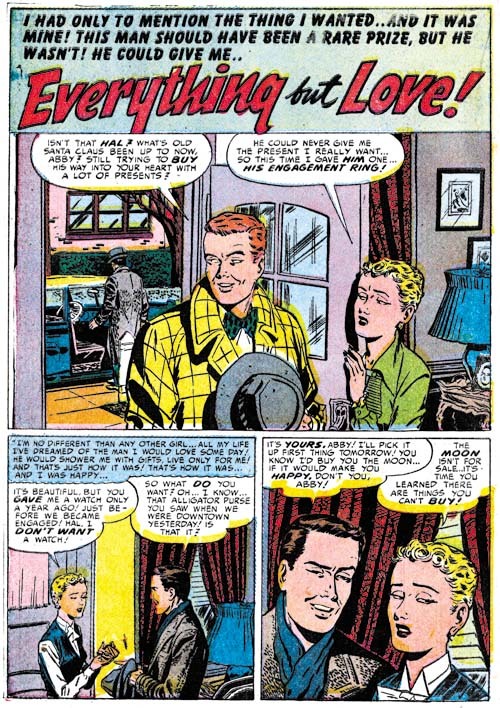 As far as I can tell there was no difference between the contents of any of the three love comics except that Kirby would appear more often in the flagship title, Young Romance (although during the period covered in this chapter Kirby would not appear in Young Romance at all). By the way, Young Brides is another of those successful titles that would last well beyond 7 issues. As the reader can see on the chart shown above, the new title Young Brides was released at a relative peak in the number of romance titles published. 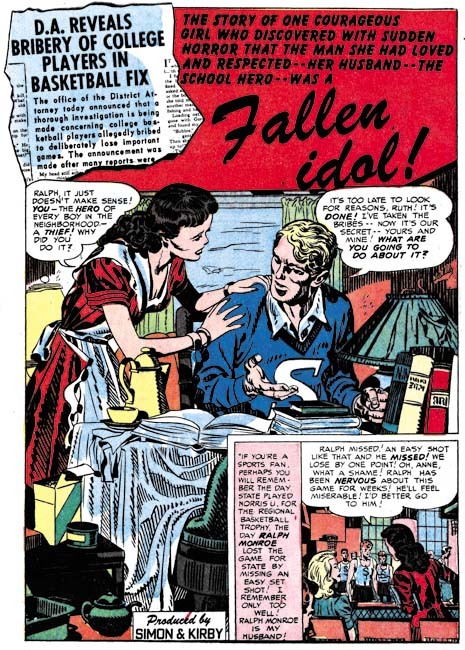 I use the tracking of the number of romance titles over time as a means of deducing the popularity of romance comics and even as an indicator for comics in general (The Real Reason for the Decline of Comics). 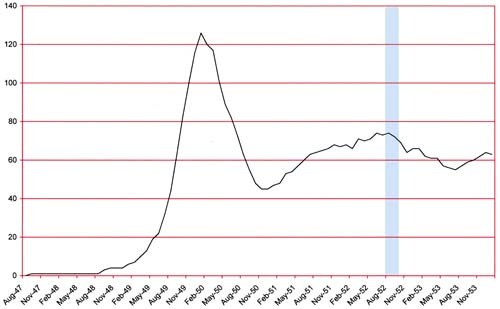 I still do not have an adequate explanation for this relative peak and the decline that followed. Was it similar to the romance glut where publishers grew overconfident and ended up with more romance titles than the market could bear? Or was there some external factor such as the rise in criticism of comic books in some sectors of the public? Like I said, I really do not know but it does not appear that starting a new love title at this time was a poor business decision because Young Brides would go monthly a year later which is a sure sign that sales where very good even with three romance titles. 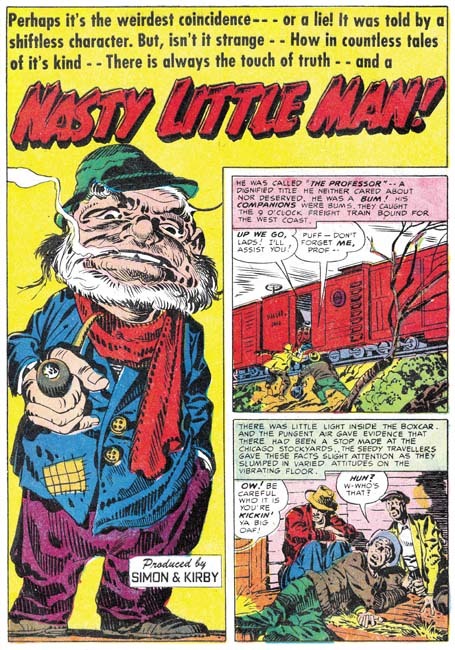 Surprisingly the most prolific artist for these seven issues was Bill Draut (59 pages). 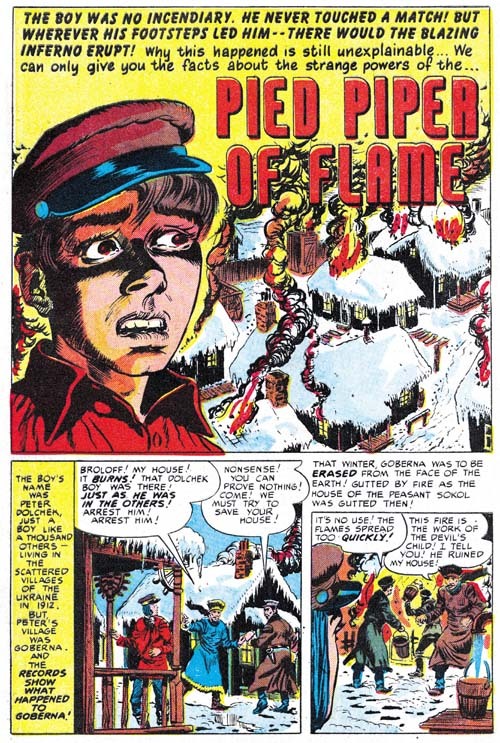 Bill is a consistent presence in Simon and Kirby productions but he is generally overshadowed by either Jack Kirby or Mort Meskin in terms of quantity. Meskin was still prolific supplying 51 pages. Other artist provided significantly less; John Prentice (29 pages), Al Eadeh(?) (24 pages), and a surprising fifth place for Jack Kirby (23 pages). Other artists (Bill Walton, Bob McCarty(?) and George Roussos would supply only single stories. 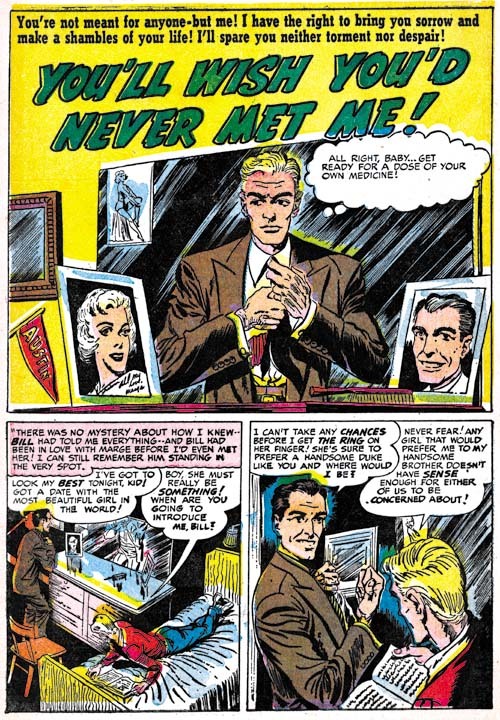 Another indication about the more reduced roll that Jack Kirby has been taking in the romance titles is that he only did one of the seven lead stories. 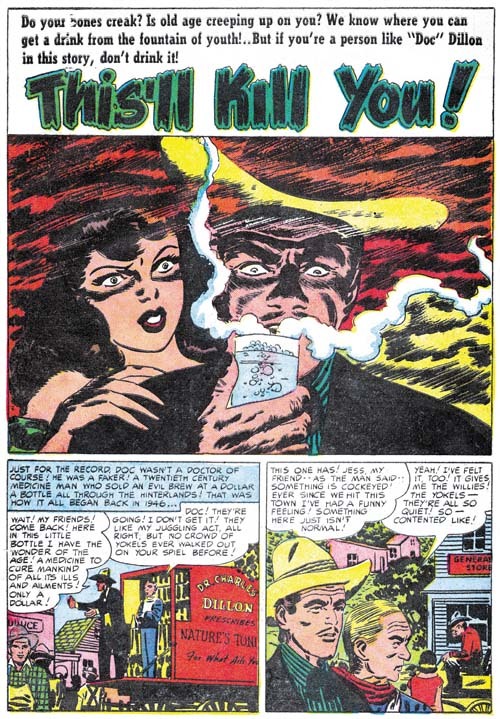 The lead story typically starts with a confessional splash; one where one of the characters introduces the story to the reader and their speech balloon becomes the title. 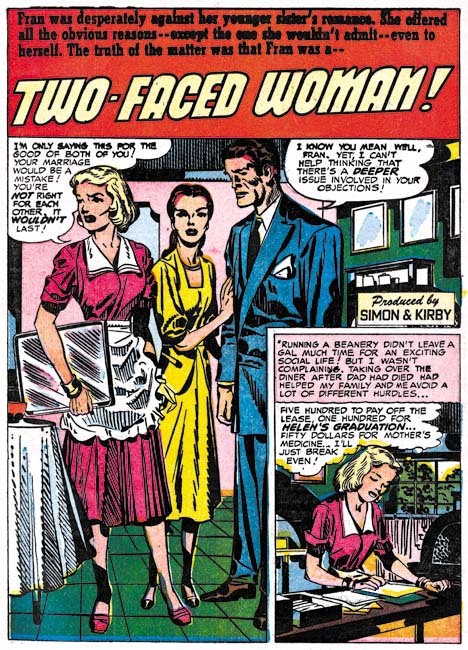 The confessional splash was very effective and it seems strange that Kirby did not go with it for the splash used in “Two-Faced Woman”. Frankly this splash while technically well executed just does not have much impact. The verbal exchange just does not seem to match the splash well. However the inking was by Kirby and is quite superb. More than any of the other studio artists, Kirby always liked to add a little action to his romances. Slaps did not play a big part in Simon and Kirby productions but check out that last panel. In movies the man slapped would often hardly flinch, but this lady certainly put some muscle behind it. Kirby may not have used the confessional splash but it would appear with other artists. Bill Draut made some particularly good use of that splash format. 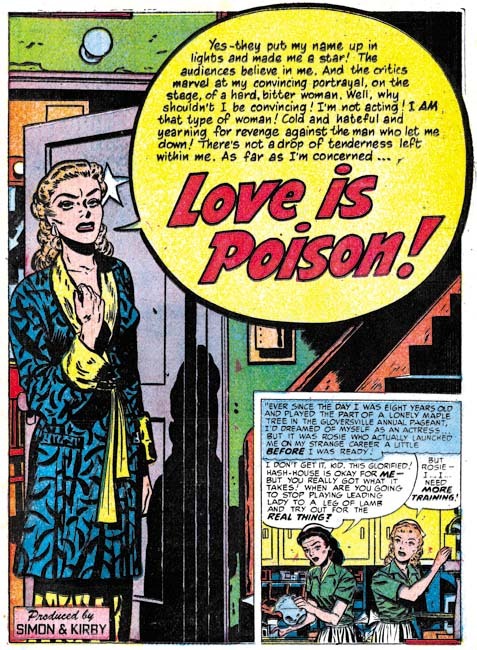 In “Love is Poison” even without reading her speech we can tell she is a bitter woman. The star on the door behind her shows she is an actress but the peeling paint above her indicates that she is not appearing in a big time movie or Broadway show. 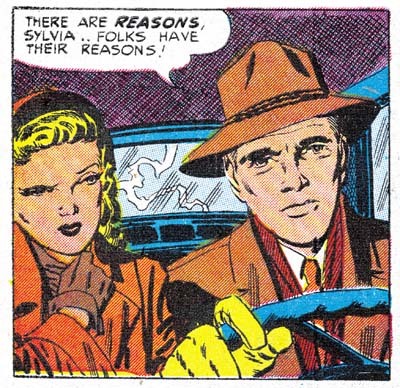 Draut was second only to Kirby among the studio artists in providing such emotional portrayals. 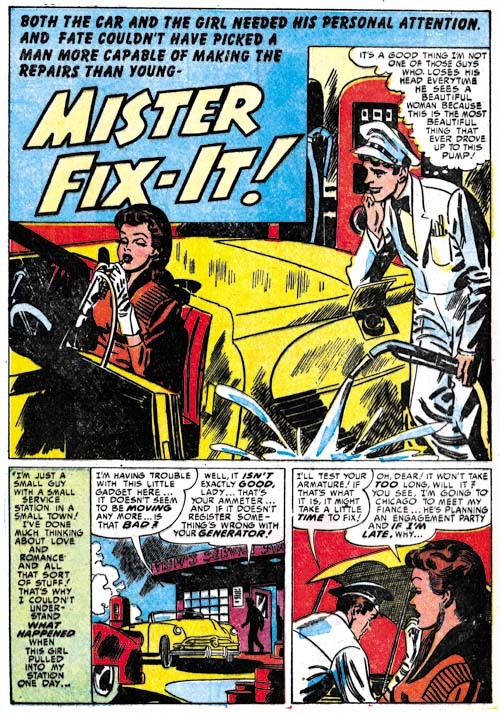 Draut did four of the seven lead stories and some of his splashes are so good that I wanted to include another example. The splash for “Money, Money, Money” may not have quite the impact of “Love Is Poison” but I love his portrayal of the grocery boy waiting to be paid (somehow I do not think he will get much of a tip). The inking of the upper part of the page is rather unusual for Bill. Mort Meskin may not have drawn splashes with the emotional impact found in those by Kirby or Draut, but he was great at humor. The gas station attendant feels that he is calm and collected while he unknowingly misses the gas cap and pours the fuel on the ground. Mort did these humorous splashes so well it is small wonder that he seem to do more of them than any other studio artist. 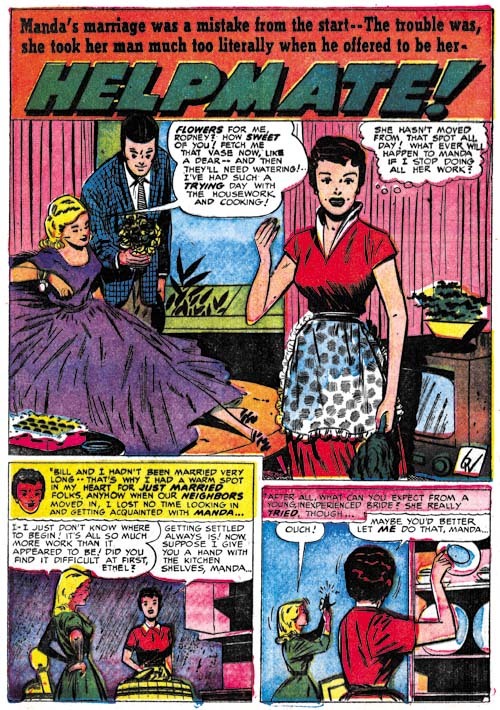 Young Love #38 (October 1952) “Take Care of My Sweetheart”, pencils by Mort Meskin, inks by George Roussos? 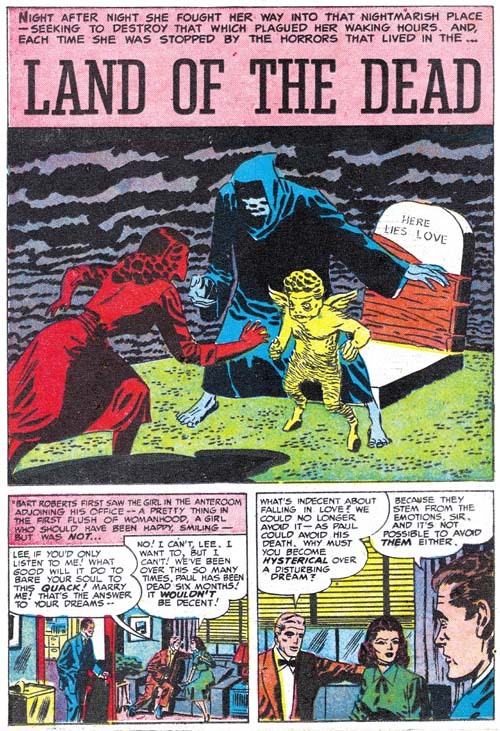 Although I generally do not make a point of it, Mort Meskin did his own inking while working for Simon and Kirby. I say this based on an examination of the work itself and it was verified recently by a comment that Joe Simon made to me. Meskin was very productive and sometimes I feel that some of his worked suffered because of that. However some of the work in this period seems particularly poorly inked, as for example “Take Care of My Sweetheart”. This is unfortunate because the composition for the splash is rather nice. But the inking does seem rushed and the end results rather crude. 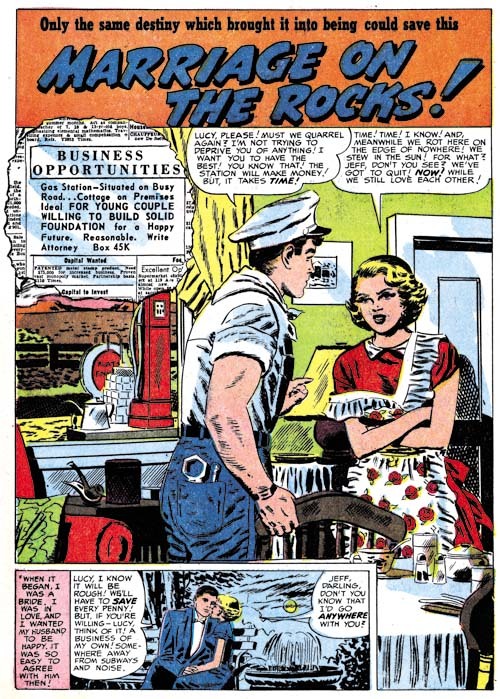 Young Romance #49 (September 1952) “The Way They Met”, pencils by Mort Meskin, inks by George Roussos? 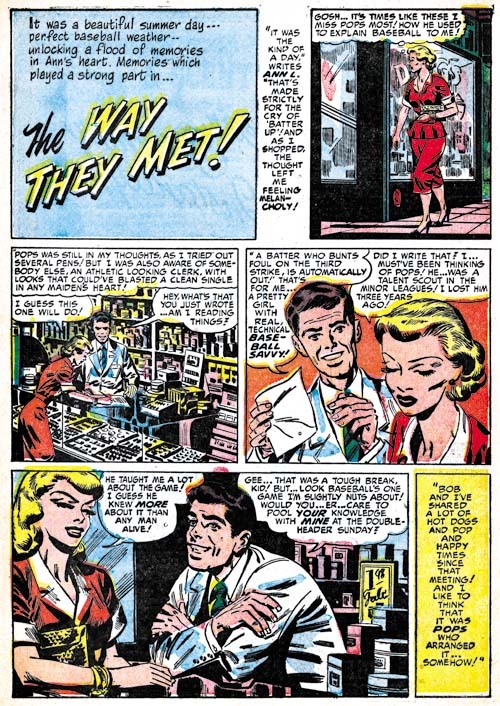 “The Way They Met” from YR #49 is another example of uncharacteristically poor inking on a work penciled by Mort. Normally the cloth folds made from a series of narrow parallel lines are an indication that Meskin did the inking so I might attribute it all to a particularly rushed job. However while the faces have Meskin’s classic grin they also have a resemblance to those drawn by George Roussos. So I suspect what is going on is that Roussos is helping with the inking. 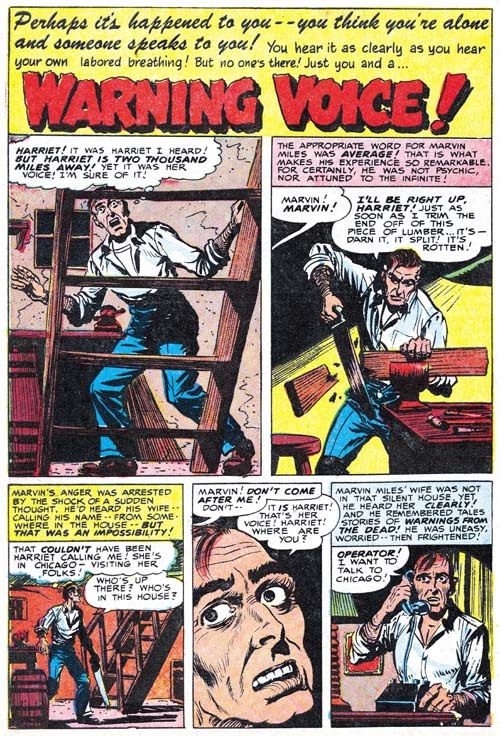 Unlike Kirby, Meskin at least sometimes indicated the spotting in his pencils (The Eleventh Commandment) which may explain why Roussos adopted some inking techniques not found when inking his own pencils. 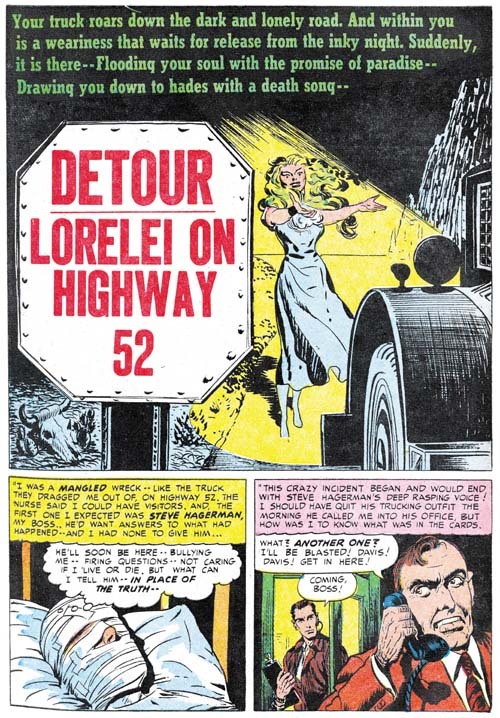 The two lead features not drawn by either Draut or Kirby were done by Prentice. This is a clear sign that Simon and Kirby valued his contribution and I think with good reason. While I like the art that Kirby, Draut and Meskin were providing I think Prentice was just what was needed to provide the titles with a healthy mix of styles. 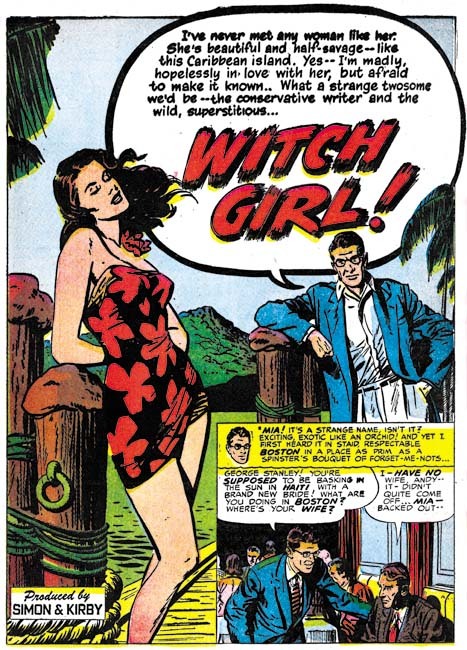 “Witch Girl” uses the almost standard confessional format (John’s other lead feature, “Jay’s Protege”, does not). While Prentice might not quite have Kirby’s or Draut’s talent for the portraying of emotions, he certainly could draw beautiful women. 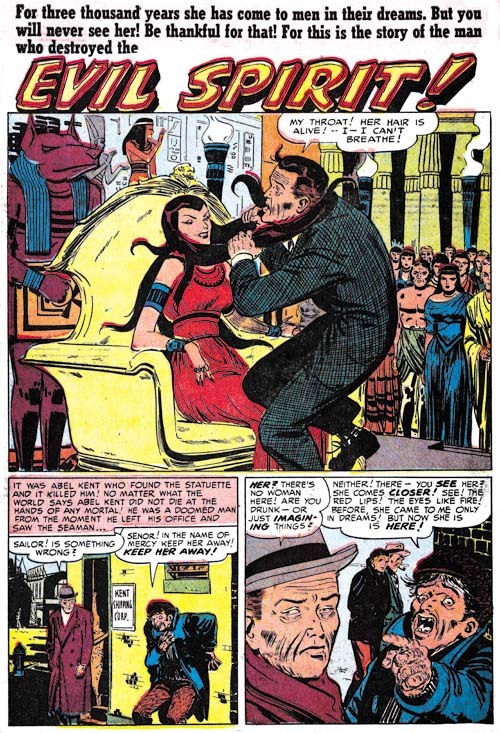 Prentice was greatly influenced by Alex Raymond and the male character looks like Rip Kirby. This is ironic because Prentice would take over the strip after Raymond’s untimely death in 1956. There is a single story, “Helpmate” signed with just initials. Even if the art style was not clue enough, a comparison of those initials with Bill Walton’s signature in stories like “Say the Magic Words” (Black Magic #12, Chapter 5 of the Little Shop of Horrors) show them to be identical. Walton did work for a number of different comic publishers at the same time. He would not play a big part in Simon and Kirby productions but he would appear on and off for a couple of years. I provide another example of work that I questionably attribute to Al Eadeh. The way the artists draws eyes, particularly for women, is so distinctive that it should be relatively easy to determine if this work really was done by Eadeh once I have managed to compare it with signed work for another publisher from this period. My problem with resolving the attribution of this work to Bob McCarty (or not) is different than with the case of Al Eadeh(?). There is some work for Foxhole that can safely be attributed to McCarty. It is just a matter of seeing whether traits that make this work like distinct from the Foxhole work change with time or remain constant. The most distinctive difference is the large eyes used in these earlier pieces as can be seen in the above page.